The launch of a new patient engagement group for those with blood conditions brought together patients, clinicians and researchers to discuss patient involvement. A screening of the film People are Messy and a group discussion at the Ultimate Picture Palace marked the launch of the Oxford Blood Group, a new local patient engagement group for those with blood disorders. People are Messy is the recording of the play by the same name produced by Oxford patients and researchers in collaboration with the Theatre of Debate. The play explores the experience of two young men with a rare inherited anaemia, and their efforts to contribute to clinical research. The play touches on the interests and constraints of all players in patient involvement, from how patients interact with their clinicians (ranging from grateful to questioning) to the time constraints on researchers and their own emotional baggage. The screening was followed by a group discussion moderated by Nigel Townsend, Director of Theatre of Debate. 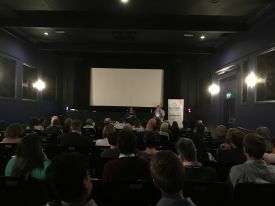 “People are Messy was a provocative and emotional film that stimulated an interesting discussion between patients, researchers and doctors,” said Dr Bethan Psaila, a researcher at the MRC Molecular Haematology Unit (MRC MHU) who attended the event. “It underlined the importance of an open dialogue between clinician scientists and patients on priorities for medical research, and prompted a number of ideas for how the Oxford Blood Group can help us achieve that here in Oxford.” The discussion explored the different views of the audience, and considered difficult questions such as the need for psychological support for patients following a life-changing diagnosis, time constraints on NHS professionals and the lack of ‘protected time’ for researchers to involve patients in their research. The Oxford Blood Group is a patient engagement group for anyone who has experience of a haematology (blood) condition, either now or in the past, as a patient or someone close to a patient. The Oxford Blood Group aims to promote and facilitate good research practice in patient and public involvement in haematology research and practice, and is supported by the Oxford Biomedical Research Centre. The launch of the Oxford Blood Group was supported by the MRC MHU.